Home / 2017 Worlds - Now on. 2017 Worlds - Now on. 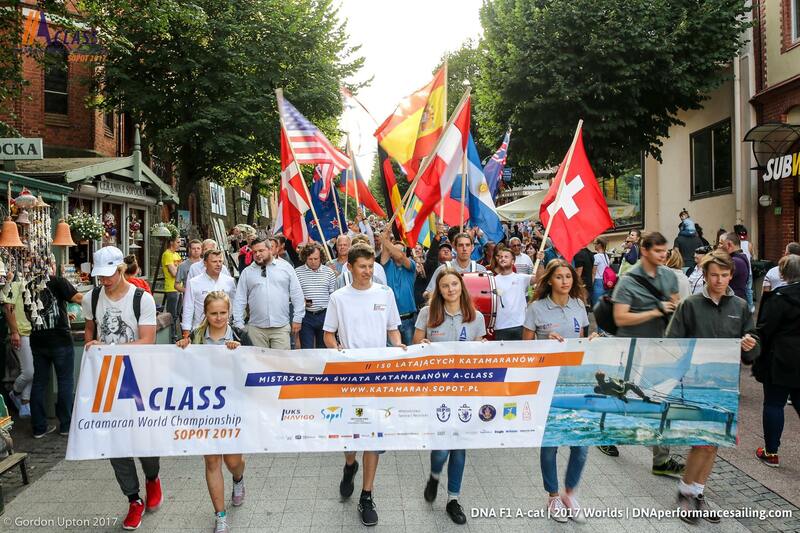 The 2017 A Class Catamaran World Championships are now officially underway. Robert Griffits had a few minutes spare to pen (or rather I-Pad) this. Early last night, the event was officially declared open by the mayor of Sopot in a ceremony held in the main square of the city. The ceremony was preceded by a parade featuring the flag bearers of the 19 nations competing, leading the field of competitors ,and even a few of their canine companions. The speeches were short congenial , and heartfelt. The standout feature of this regatta so far in the warmth and hospitality of the Polish people. This extends beyond the organising people to the men and women whom we meet in the street. The Polish organising committee has set a new benchmark in standards. No detail has been overlooked. The Registration process was smooth, methodical, and without fuss. All boats have an allocated position on the beach, and boat launching and retrievals are aided by an enthusiastic band of young volunteers. On water organising has also been slick. The Practice Race was held yesterday under cloudy skies , and light , variable , and shifting winds. The Fleet was split into an Alpha and Beta division, and the racing commenced promptly on time, after conclusion of the sail past off the magnificent Sopot Pier. It was was inconclusive in terms of assessing form, as so many people seemed to follow that somewhat silly traditional practice of not completing the course. The wind forecast for the Championship races is for a light wind series, with winds essentially below 10 knots. I understand that many of the short mast rigs have been quietly set aside for this regatta. The marginal foiling conditions will favour those whom have totally mastered the art of foiling. The winds here are very shifty and patchy, but the law of averages should flatten out the luck component across the proposed 12 race series.